12117 Ruby Gold Sunfire Glass Vase / Quest for Bids - Find your hidden treasure! SHIPS FREE Brilliant reds and golds glow in any light, bringing a burst of color to any room. 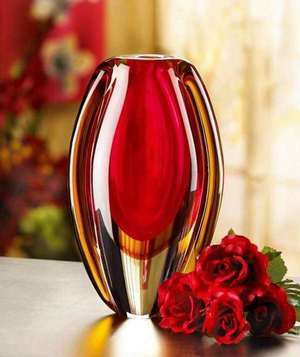 Add your favorite blooms to this striking glass vase for a breathtakingly beautiful focus piece! Decorative purposes only. SIZE: Measuring 5 1/2" wide x 3" deep x 9" high. RETURN POLICY: All of my items are in stock at time of listing. Should an item sell, you will be notified via email and a full refund will be issued. On any item I will need a photo of the parts missing or broken item. Shipping and handling charges are not refundable..
Payment to be made within 3 calendar days of order invoice. I will accept PayPal Credit Card payments (using Master Card, Visa and Discover) or E-checks (takes 3-4 days to clear). Item(s) will ship within 2-3 working days or sooner. NO PO BOXES PLEASE ON UPS ORDERS -Cannot ship to APO/FPO Military boxes. Extreme care goes into packing your items. Buyer to pay for shipping charges unless stated SHIPS FREE!! Please allow 7-14 days for delivery on UPS shipments. All UPS orders are shipped within the continental US only. I will refund the difference over $1.50 to your Paypal acct. Buyers from Hawaii or Alaska, please contact me for your rate. Payment to be made within 3 days from purchase. Shipped UPS Ground which includes tracking number. For Christmas arrival order must be placed by 12/16.